Display Multifunction There are 53 products. 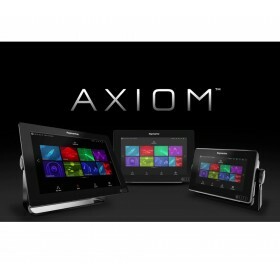 AXIOM 12 Display Multifunzione 12.1"
AXIOM 9 RV Display Multifunzione 9"
AXIOM 9 Display Multifunzione 9"
AXIOM 7 RV Display Multifunzione 7"
AXIOM 7 DV Display Multifunzione 7"
Axiom 7, Multifunction Display (MFD) 7 "
Axiom will radically change your water experience. Garmin GPSMAP® 1022 GPSMAP 1022 is designed for cruisers, sailors and sailing racers who need the advanced all-in-one solution provided by our 10-inch keyed chartplotter. Features a large, bright screen coupled with a quick and easy-to-use keypad interface with user-programmable keys and a multifunction control knob. Garmin GPSMAP® 1022xsv Experience an advanced all-in-1 solution with our 10-inch GPSMAP 1042xsv keyed combo. Includes transducer for Garmin CHIRP sonar, CHIRP ClearVü and CHIRP SideVü (also available without transducer). It also has built-in support for Panoptix all-seeing sonar and premium Garmin sonar modules (transducers sold separately). Garmin GPSMAP® 1222 GPSMAP 1222 is designed for cruisers, sailors and sailing racers who need the advanced all-in-one solution provided by our 10-inch keyed chartplotter. Features a large, bright screen coupled with a quick and easy-to-use keypad interface with user-programmable keys and a multifunction control knob. Garmin GPSMAP® 1222xsv Experience an advanced all-in-one solution with our 12-inch GPSMAP 1222xsv keyed combo. Includes built-in support for Garmin CHIRP sonar, CHIRP ClearVü and CHIRP SideVü. It also supports Panoptix all-seeing sonar and premium Garmin sonar modules (transducers sold separately). GPSMAP 8424 large-format multifunction display features a 24-inch full HD screen with touch control. Sunlight-readable, anti-glare display is exceptionally easy to view and also includes auto-dimming feature for use in low light or at night. GPSMAP 8422 large-format multifunction display features a 22-inch full HD screen with touch control. Sunlight-readable, anti-glare display is exceptionally easy to view and also includes auto-dimming feature for use in low light or at night. GPSMAP 8417 large-format multifunction display features a 17-inch full HD screen with touch control. Sunlight-readable, anti-glare display is exceptionally easy to view and also includes auto-dimming feature for use in low light or at night.